Bong Joon-Ho's 'Okja' Is As Weird A Hybrid As Its Porcine Star Bong's clever dark comedy, about a enormous, genetically modified pig and the adorable moppet who loves her, veers wildly in tone, but the CGI oinker at its center is a marvel. 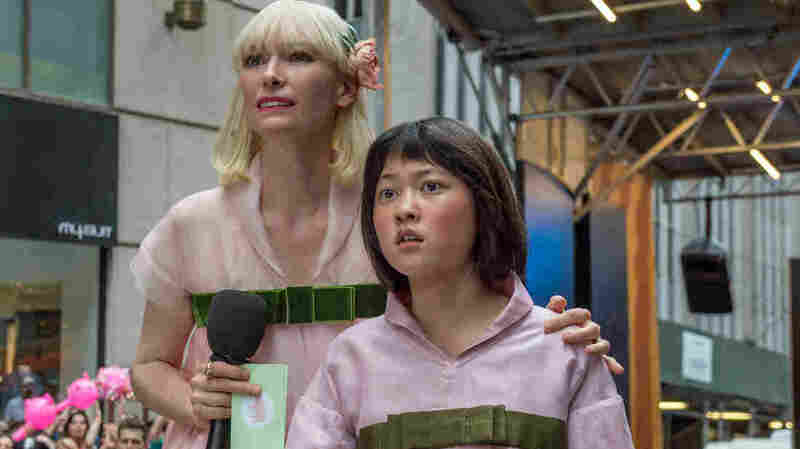 Lucy Mirando (Tilda Swinton) and Mija (An Seo Hyun) in Okja. Big as a Buick and with a buck like a bronco, the giant gray pig named Okja is a force to be reckoned with. She was born in a lab — well, two labs. In the context of Bong Joon-ho's new film Okja, the pig belongs to a nightmarish food conglomerate, an obvious Monsanto stand-in, which ships her to a small family farm in South Korea as part of a calculated effort to make genetically modified food less scary to the public. If people empathize with their mutant pigs, the company reasons, they'll eat them without questioning their origins. Of course, Okja is also the product of this movie's special-effects lab, which, like this fictional food giant, wants us to empathize with a mutant pig. And she's something miraculous: A grunting, galloping creature of real soul, whose CGI hide looks to be as thick as that in any petting zoo. Pigs like Wilbur and Babe make for great movie heroes, perhaps because of their natural mix of intelligence and naivete. They are, after all, doomed to spend their lives outrunning the sausage machine. So what would seem to be bad for (agri)business is great for show business. Go ahead and put a lovable face on that meat. As a director, Bong has always been open to lab experimentation. He re-spliced the genes of the serial killer flick in Memories of Murder and the monster movie in The Host, creating haunting thriller/comedy hybrids that ensnared us in their extreme tonal shifts and grotesque visions of humanity. Here, with certified chronicler of fringe life Jon Ronson (author of The Men Who Stare At Goats and So You've Been Publicly Shamed, among others) as his co-writer, Bong delivers the oddest anti-GMO commercial in either the East or the West. And Netflix brings yet another layer of abnormality to the movie's DNA, because the service's plans to make Okja available for streaming on the same day as its (very limited) theatrical release prompted boos when the logo appeared at its Cannes Film Festival premiere. Honestly, though, a movie about the purity of food should be enjoyed on more than the cinematic equivalent of the microwave. On the hunt for her best friend, the simple farm girl soon finds herself at odds with armies of violent, cynical city-dwelling adults. Like Bong's previous movie, Snowpiercer, Okja boasts a multi-ethnic cast — while the rest of Hollywood struggles to make movies that will appeal to every market, his approach is to simply bring nations together into one shared nightmare. Tilda Swinton had such a good time playing the face of corporate evil in Snowpiercer that she reprises the role twice, as twin-sister Mirando executives: the first vain and petty, the second ruthless. Mirando fights a tug-of-war for Okja against a radical animal-rights group led by Paul Dano's soft-eyed rebel Jay, who stages a highway abduction of the pig in Seoul. The group pledges never to harm a living soul, so they refuse to ram a truck off the road until every passenger has secured their seatbelt. The film shares Bong's casual ping-ponging of tones, his fascination with picking at society's many scabs, and the way his films frequently skid into violence and cruelty without warning. A climax in a slaughterhouse is so bleak, with blood dripping through the grates of the killing floor, that Bong seems to be setting up a Planet of the Pigs-style overthrow. Elsewhere, the dark humor has a hint of Paul Verhoeven's mischievousness: One Mirando employee shrugs his shoulders when Okja escapes, saying he doesn't get workman's comp. But Okja is less controlled than Bong's earlier work. It seems determined to use every part of the proverbial animal, meaning a lot of the weird character traits it throws to us never have satisfying payoffs. And the oinker herself? She's the real star, especially in the film's early segments, when she gets to splash in streams and climb rocks. Of course she poops everywhere, too, and sneezes on Gyllenhaal as though he were the villain in an '80s family comedy. Most impressively, Okja is a central player in action scenes that make urban chaos look smooth as butter. A centerpiece chase through the streets of Seoul, in which Mija and the massive animal plow through an underground shop, is Mad Max-worthy. In the clever world of this film, genetic modification brings with it a touch of humanity, even as everyone surrounding it seems to have little recognizable human qualities. Some pig, indeed. Editor's note: A previous version of this story mixed up the words "empathize" and "emphasize" — thanks to all the readers who caught it! A previous version of this review incorrectly stated Mija's age as 8. She is a teenager. We also incorrectly identified the character of Hee Bong (Byun Hee-bong) as Mija's uncle. He is her grandfather.